Some of you may have seen my "ad" on Facebook. I'm only offering these for a limited time, so I want to give some more information so that you can see the advantages to hosting a picture party. 1 - Invite and "book" AT LEAST four of your friends and their families (can be couples, children, families, etc). 2 - Decide on a location (outdoor is best, since I'm a natural light photographer). Can be at the farm, or any location of your choice. 3 - Each friend/family gets a 30 minute mini session during the reserved party time (ex. 2.5 hour party with 5 participants). 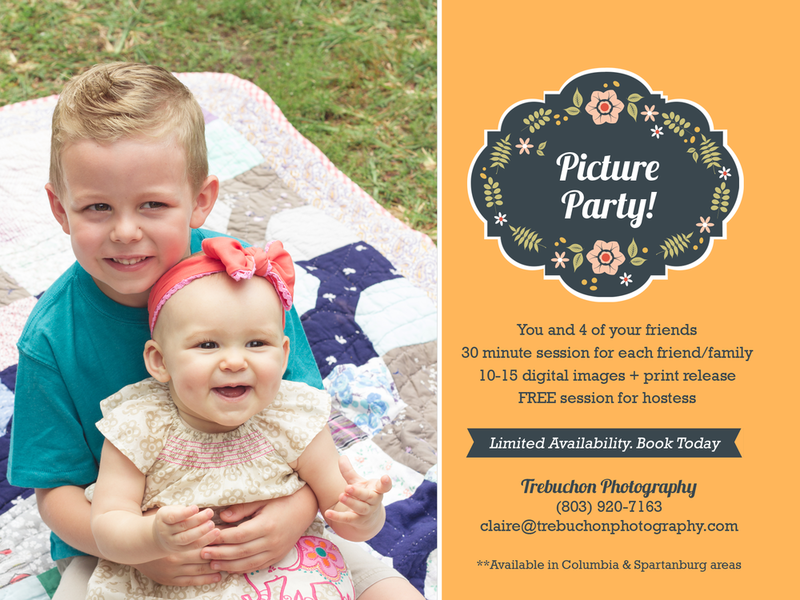 The biggest advantage to hosting a picture party is that once you have at least four sessions booked, you get your mini session FREE! All mini sessions come with a gallery of 10-15 high resolution images that are available for dowload with a print release. I will only be offering Picture Parties for a limited time, so book yours today! Feel free to email me at claire@trebuchonphotography.com with any questions.